If you’ve ever tried to lose weight then you’ll know how hard it is to resist all those unhealthy snacks. Cakes, popcorn, ice cream, chocolate bars… They’re everywhere you turn trying to claw you back to the dark side. Even with an intense workout schedule, it’s almost impossible to get into shape while eating junk food. Luckily, there are many tasty, healthy snacks available that will actually help you lose weight! Not only are apples and peanut butter a healthy snack, they are absolutely delicious together. They are perfect to eat any time of the day, filled with the right nutrients to make you feel alert and focused. This snack is actually relatively high in calories, but as long as you stick to natural peanut butter and keep below your daily calorie goal you’ll be fine. There’s a big difference between natural and processed peanut butter. The natural version does not include any of the unhealthy ingredients that normal peanut butter does, such as sugar and hydrogenated oil. Apples and natural peanut butter will provide a good dose of protein that will help fuel your exercise, and enough calories to curb your appetite. Plus apples are a good source of fiber which is very important to include in your diet when trying to lose weight. One of the most delicious snacks you can eat while trying to lose weight is sliced tomatoes with sprinkled feta cheese and a little bit of olive oil. Tomatoes pack a number of powerful nutrients and are very low in calories, yet not everyone knows just how healthy real feta cheese is. Unlike many other kinds of cheese, feta is made in Greece in a certain way. It’s far lower in calories than other cheeses, such as cheddar, and contains high amounts of both Vitamin A and K. This is a great snack to eat in the morning. Edamame, or immature soybeans, make for a surprisingly healthy and delicious snack. They’re often included with other foods such as tofu and soy sauce, and are also a popular snack by themselves. Soybeans, like many other types of beans, are high in protein. Just one cup of edamame provides nearly 18 grams of protein. Recent studies link soybeans to helping lower cholesterol and risk of heart disease. They’re very low in calories and can be eaten throughout the day. Kale is one of the healthiest foods you can eat. It is filled with vitamins and nutrients that will make you feel energized and alert. Any way to eat kale is fantastic, however, kale chips are perhaps the best way to snack on this incredible plant. Many supermarkets sell kale chips, yet some health experts recommend making your own to ensure there are no unnecessary ingredients added. Simply mix kale leaves, olive oil, and a little salt in a bowl and bake them for 10-15 minutes at 350 degrees Fahrenheit. You’ll have a delicious, healthy snack to enjoy anytime you want. Chocolate isn’t normally thought of as a healthy food, however dark chocolate is rich in many nutrients and antioxidants and is substantially lower in calories than milk chocolate. 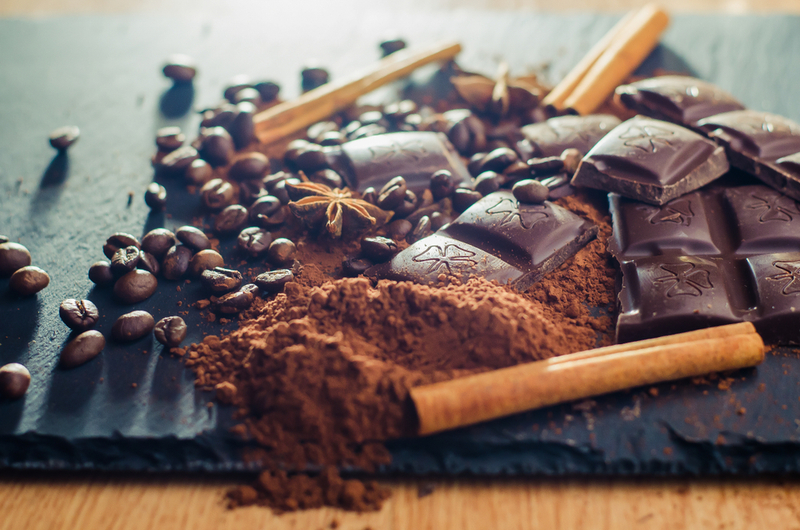 Dark chocolate isn’t necessarily something you should be snacking on all day, yet studies show that small amounts on a daily basis help to prevent heart disease and improve overall cholesterol. Furthermore, dark chocolate is low in calories at around 155 per ounce. Lastly, it’s delicious and pairs well with many other healthy snacks. The health benefits of carrots are well known. They’re rich in vitamin A which improves eyesight, they contain carotenoids that lower the risk of many cancers, and they help with digestion thanks to the large amount of fiber. Snacking on carrots is without a doubt one of the best foods to help lose weight. Even blue cheese has some great nutritional benefits. The fat in the dressing will further increase carotenoid absorption to help more with digestion and increase your metabolism. It also makes the snack taste better, and isn’t unhealthy when eaten in moderation. Another snack taken from the Mediterranean Diet, olives are a fantastic choice to eat any time of the day with many great health benefits. Olives belong to the fruit group called drupes, and are extremely high in Vitamin E.
These amazing little snacks are filled with healthy fat that helps to give your body energy. Olives are also very low in calories. Ten olives only amount to about 60 calories, the majority of which is fiber and healthy fats. Pairing olives with other healthy snacks is a great way to satisfy your appetite without feeling guilty. There are many healthy snacks available that provide with your body with the nutrients it needs to be at its best. Cutting out junk food will immediately help you get on the path to reach the weight loss goals you’ve set for yourself.